I never have, and never will, take a handgun training course. But that ad has been coming up a lot recently. Could it be? …… Recently I was checking out what all the fuss was about WalMart selling assault weapons. I had to see for myself. So I went to the Walmart web site and did a search for something like “assault weapons”, and I immediately saw a large selection of killing machines. I was disgusted. Here, in the same place where you go to buy birthday candles and yoga mats, you can also buy machines designed to send many pieces of metal at high speeds that are meant to pierce flesh and cause mortality. Walmart sells assault weapons but bans music that contains swear words. So, you can imagine how bothersome it might be for a person like myself to have to see this ad sitting inches away from my email messages – especially considering that I may have actually been targeted. I don’t know what’s worse, a system of targeting ads to people that gets it all wrong, or a system of targeting ads to people that gets it totally right. Personally, I’d prefer no ads at all. But I understand that ads pay for this free service – which I guess is pretty cool. 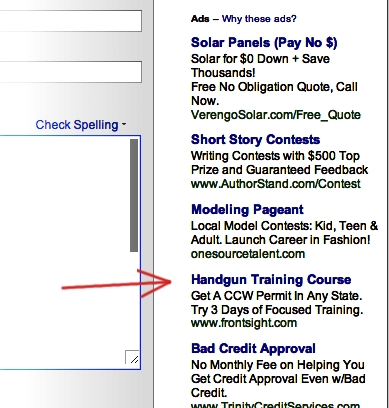 So, I’ll have to settle with seeing ads for handgun training and “Bad Credit Approval” (another total misfire). Jon Mitchell’s article: “What Do Google Ads Know About You?” gives some detail about Google Ads, as well as some interesting opinions.